The Cretan Hieroglyphic script is a non-deciphered writing system found in Crete and, sporadically, on the islands of the Aegean Sea (Kythira and Samothrace) from the 18th to the 17th centuries BC, the period of the so-called “First Palaces” on Crete. All the same, it is possible that it was first used in the “pre-palatial” period. In fact, some seals from central Crete, datable from the 21st to the 19th centuries BC, present traces of a similar writing system (the so-called “Archanes script”, named after the place where the seals were found). Some seal impressions with inscriptions in Cretan Hieroglyphics have been found in contexts datable to the 15th century BC. Such findings, far from proving that the Cretan Hieroglyphics had survived until such a late period, can be explained very simply as the result of a residual use of some old seals. The term Cretan "Hieroglyphic" was coined by A. Evans (1851-1941) based on the presumed similarity of some symbols with those of Egyptian Hieroglyphics. These similarities later showed themselves to be illusory. All the same, the term "Hieroglyphic" has been maintained for respect to tradition. Cretan Hieroglyphics have no antecedents outside of Crete. It is therefore probably a local creation, in part inspired by the general principles of the coeval Near Eastern writing systems. We possess just over 350 inscriptions in Cretan Hieroglyphics. 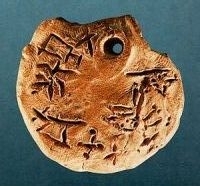 More than half of these are engraved on archive documents in clay (tablets, four-sided bars, medallions, nodules and other items with or without seal impressions), about 140 are engraved on ivory, stone or metal seals, while a few are engraved or painted on terracotta vases and stone objects. The archive documents register commercial transactions (movements of goods in and out of the Palaces and connected buildings). The function of the seals is less clear. The presence of decorative signs beside the writing signs might lead one to believe they had an ornamental function. All the same, since some sealings bear impressions of inscribed seals, it is probable that they also had an “economic” function. As for the inscriptions on vases, a “religious” function cannot be excluded. The archive documents, inscribed or sealed, come from the sites of Knossos, Phaistos, Malia, Petras and Kato Symi (Viannos) on Crete[clickable map], and from that of Mikro Vouni on Samothrace. The engraved seals are mostly of uncertain origin, since many do not come from regular digs. All the same, they can mostly be ascribed to central-eastern Crete. Recently, however, a seal has been found at Vrysinas.The only seal which certainly does not come from Crete was found at Kythira. As for the vases, they mainly come from Malia. Cretan Hieroglyphics, like the other Cretan writing systems of the Bronze Age (Linear A and Linear B), is a logo-syllabic system, i.e., formed by logograms and syllabograms. The first are signs which correspond to words, the second are signs corresponding to syllables. The Cretan Hieroglyphic syllabary, in the current state of knowledge, is composed of 96 signs (10 of which used as logograms as well). For statistical reasons it is probable that every syllabogram corresponded to an open syllable, i.e., formed by a vowel or by a sequence of consonant + vowel. Thirty three logograms have been identified until now, and they represent objects and goods. Four symbols for numbers (1, 10, 100 and 1000) and nine for fractions (of uncertain value, sometimes used in ligatures as well) have also been identified. Cretan Hieroglyphics did not have a defined direction for writing. The sequences of syllables can therefore be both left to right and right to left. They are often preceded by a cross, used to mark the beginning of the sequence. Since Cretan Hieroglyphics have not been deciphered, the texts are not transliterated but rather transnumerated, i.e., every sign corresponds to a number in a conventional order (see “List of symbols” and “CHIC: Corpus Hieroglyphicarum Inscriptionum Cretae” in the section “Online resources”). Documents in Linear A, mostly economic documents, date from the 19th to the 14th century BC. Cretan Hieroglyphics and Linear A were thus in part contemporaneous. The fact that only about 20% of the syllabograms of the two writing systems are homomorphic excludes any hypothesis of filiation. The resemblance of the logograms and of the signs for numbers and fractions, on the other hand, is an indication of the reciprocal exchanges in accounting practices. It is not clear why these two distinct writing systems were used for similar purposes on Crete for a certain period of time. And even less clear is why in a couple of cases (Malia and perhaps Knossos) texts drawn up in the two different scripts were found in the same archive.